In March of 2004, a ten-acre, open air museum opened in Williamsburg, Virginia. 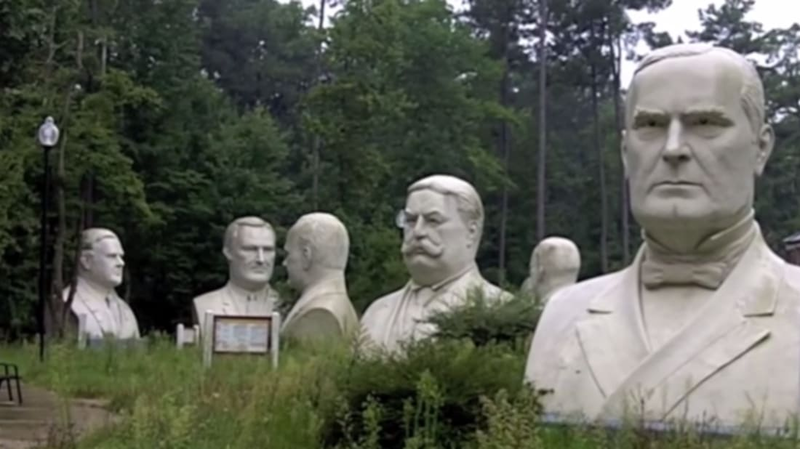 There, 18 to 20 foot high busts of the first 43 presidents of the United States (from George W. to George W.) towered over the land—just as they do over the annals of American history. The busts were the work of Houston artist David Adickes, who was inspired after driving past Mount Rushmore. With the help of entrepreneur Everette “Haley” Newman, Adickes' $10 million vision became a reality. President’s Park saw 350,000 visitors over the course of its run, but the traffic simply wasn’t enough to cover the cost of the mortgage. The park closed in 2010, and the land was auctioned off. An Enterprise Rent-a-Car now stands in its place. In 2012, local businessman Howard Hankins rescued the presidents from an uncertain fate after the owners reached out to him. He painstakingly transported the heads, which each weigh at least 12,000 pounds if not more, to his farm in Croaker, Virginia, where they’re now arranged in three neat rows. The move left the busts a little worse for wear, with visible cracking and missing pieces now visible on the faces of history’s leaders. The entire process cost Hankins around $50,000. The farm isn’t open to the public, nor is it a licensed tourist attraction. For now, it’s a place for safekeeping while Hankins seeks out a permanent home for the monuments. Although the park closed after the election of our 44th president, the collection is without a statue of Barack Obama because Adickes and Newman couldn’t afford to commission one. Maybe by the time Hankins finds them a new home, they’ll be able to add him to the mix. Check out the gallery over at DCist for gorgeous photos of the presidents at their temporary digs.